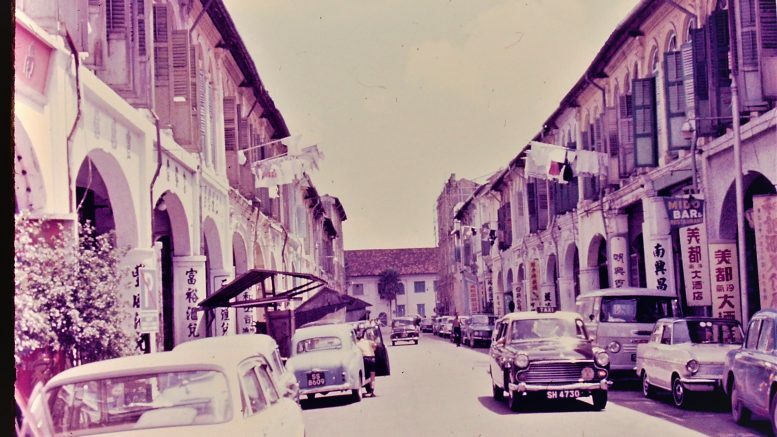 Singapore street scene in 1968; unknown location. Photo taken by Leonard Shaffer. Asia markets may face a choppy open on Wednesday, as concerns over Brexit may be in focus after the U.K. Parliament overwhelmingly rejected the current deal. Prime Minister Theresa May’s deal with the EU went down in flames in Parliament, with MPs voting against the plan 432 to 202. That was quickly followed by opposition Labour leader Jeremy Corbyn filing a no confidence motion in the Tory government, which could trigger a general election if Tory MPs come on board — although some analysts believe that isn’t likely. The vote didn’t have much of an impact on Wall Street, as the defeat itself was widely expected, with only the final tally closely watched. Separately, Netflix’s announcement that it would be immediately raising its U.S. monthly subscription fees by 13 percent to 18 percent, boosted the streaming service’s shares by 6.5 percent and helped to bolster other tech players’ share prices. Also, traders shrugged off news that U.S. megabank JPMorgan Chase reported fourth quarter earnings which missed estimates, pointed to market volatility in December as spurring bond losses. March futures for Japan’s Nikkei 225 index were up 20 points at 20,545 at 7:36 A.M. SGT, according to CME data. That compares with the index’s close at 20,555.29, up 0.96 percent, on Tuesday. The index was down 0.47 percent in early trade. Singapore’s Straits Times Index ended Tuesday up 1.22 percent at 3212.30; January futures for the index were at 3211 on Tuesday, while February and March futures were at 3214 and 3211 respectively. Hong Kong’s Hang Seng Index added 2.02 percent to 26,830.289 on Tuesday, while China’s CSI 300 tacked on 1.96 percent to 3127.99. Malaysia’s KLCI rose 019 percent to 1679.42 on Tuesday, while Indonesia’s IDX Composite was up 1.15 percent at 6408.78. The Dow Jones Industrial Average rose 0.65 percent to 24,065.59, the Nasdaq Composite gained 1.71 percent to 7023.834, and the S&P 500 tacked on 1.07 percent to 2610.30. Futures for the three indexes were a tad higher in early trade. Nymex WTI crude oil futures for February were down 0.35 percent at US$51.93 a barrel at 7:15 A.M. SGT, while ICE Brent crude futures for March were up 2.80 percent at US$60.64 a barrel at 6:44 A.M. SGT, according to Bloomberg data.